You know how some ideas just come to you...out of the blue? I made this a couple years ago for my mother-in-law. We were spending Thanksgiving together as a family and I wanted to create something meaningful that everyone could participate in, young and old alike. Something different than just going around the table and everyone saying what they were thankful for. This was it! 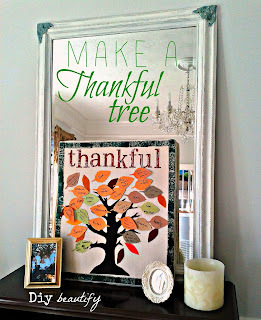 A Thankful Tree! A permanent reminder of thankfulness. The leaves contain the thankful thoughts and were cut using my Cricut. 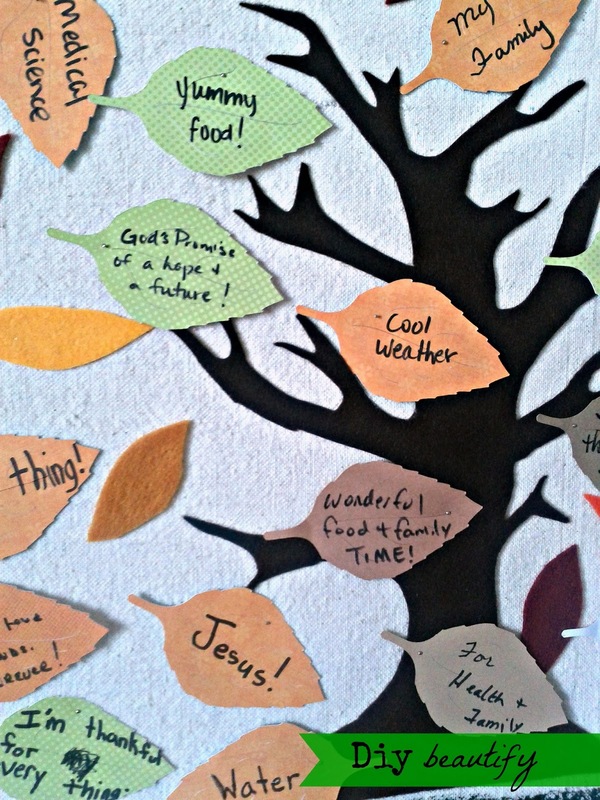 They were displayed in a pretty bowl with pins and a marker so that at their leisure, people could write thoughts down as they were inspired and attach their leaf to the tree. The background for the tree is a thick piece of styrofoam that I had leftover from a project. 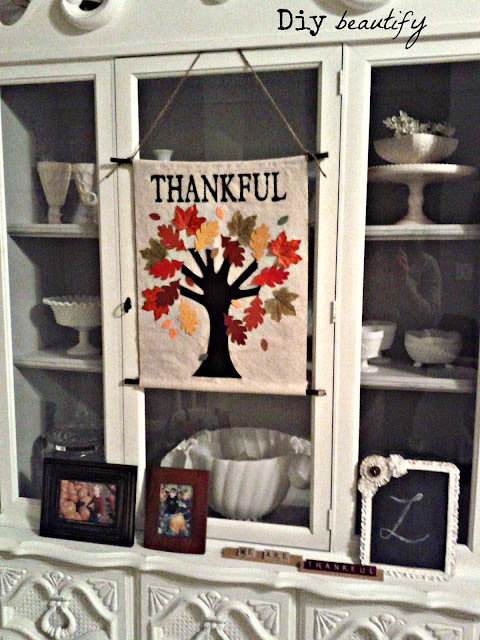 I wrapped it with drop cloth and painted a simple border around the edge. The tree was cut from felt and glued on. I added a few smaller felt leaves as well for some additional color. The letters were chipboard letters I had in my stash. The beauty about this project is that new leaves can be added every year, until the tree is loaded with thankfulness. Don't you just love that thought?? The date can be written on the back of each leaf. I think families with smaller children would enjoy seeing how their children's handwriting changes as they get older...and how their thankfulness expands! 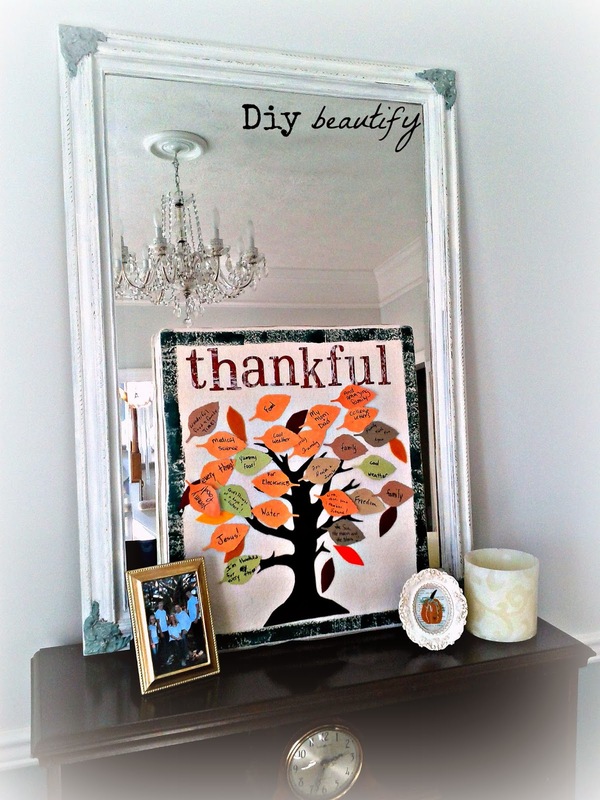 Hmm, the way it's looking, maybe I should have made a 'Thankful Forest'?? 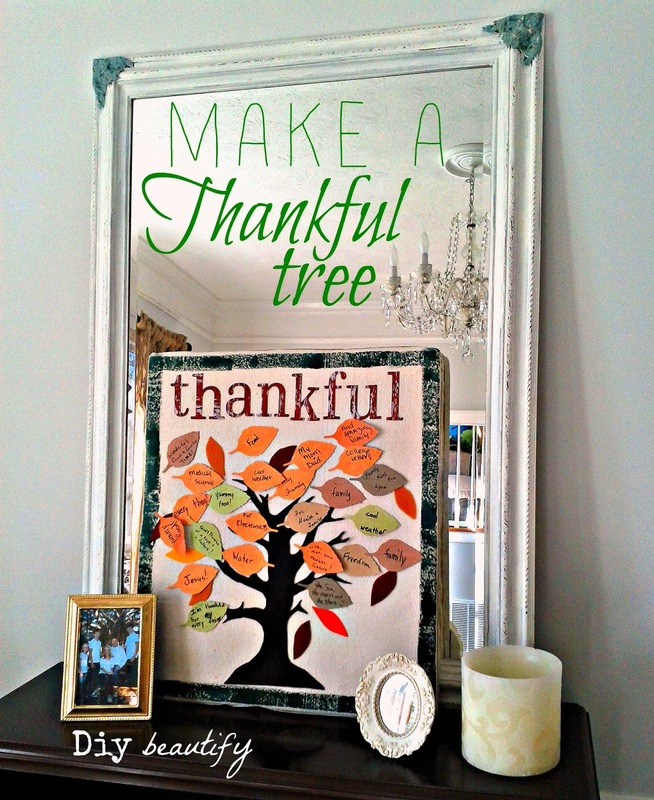 If your tree is filling up too quickly, you could remove the leaves each year and keep them in a ziploc baggie or envelope marked by date so that the tree is fresh and ready to receive new batches of thankful leaves each year. 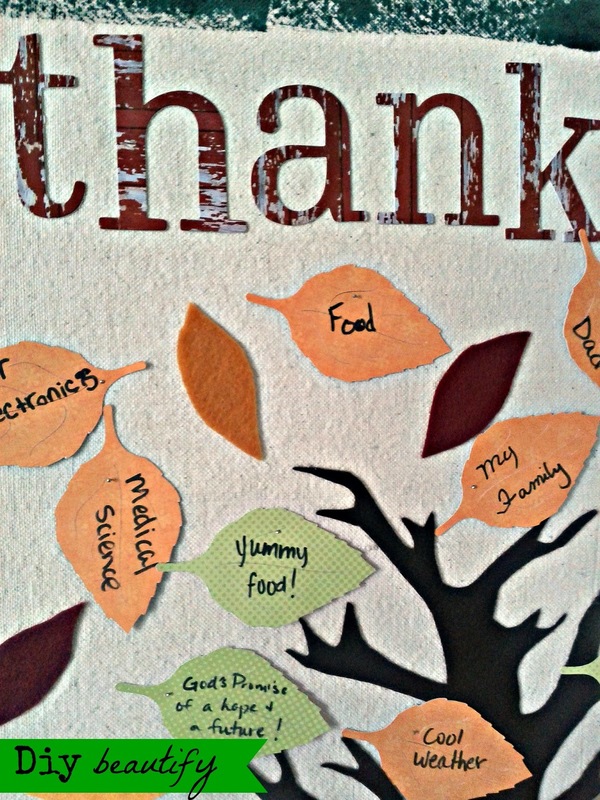 It would be fun to look back through...a 'Scrapbook of Thankfulness'! For an easier alternative, here is the version I made with the kids this week at church. 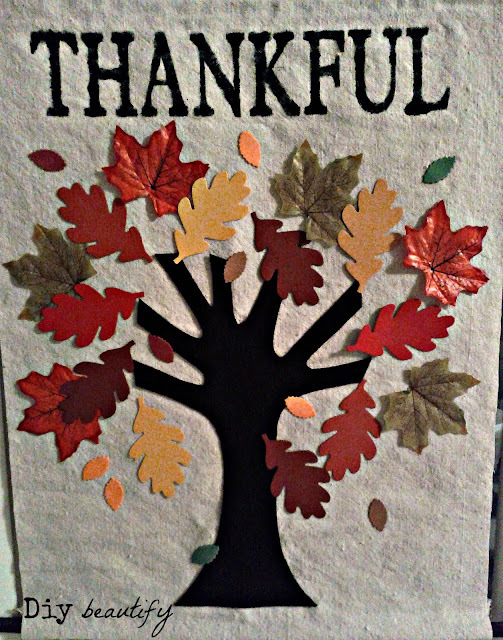 My friend Barb and I were doing a crafts class for the month of October and this was our big finale. 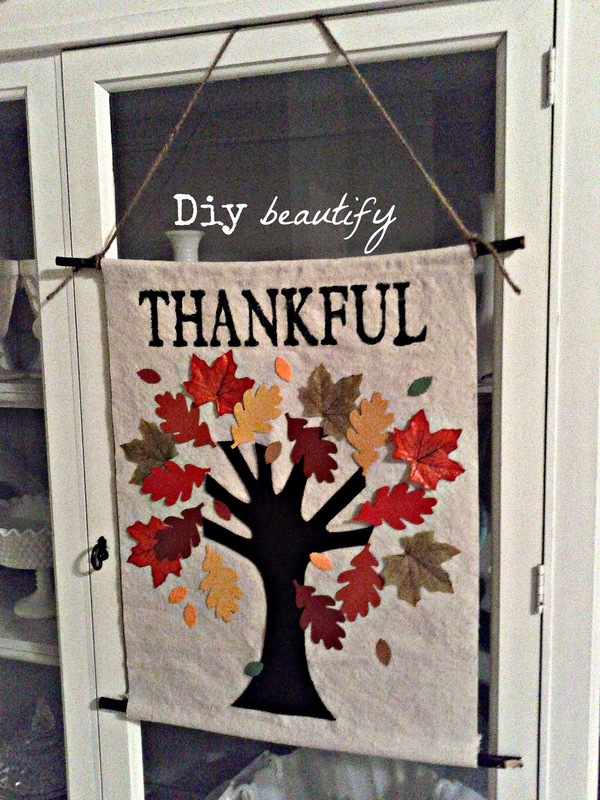 We used a piece of drop cloth for the base, gluing each end of the drop cloth around a branch. The sturdiness of the branch helps it to hang straight. 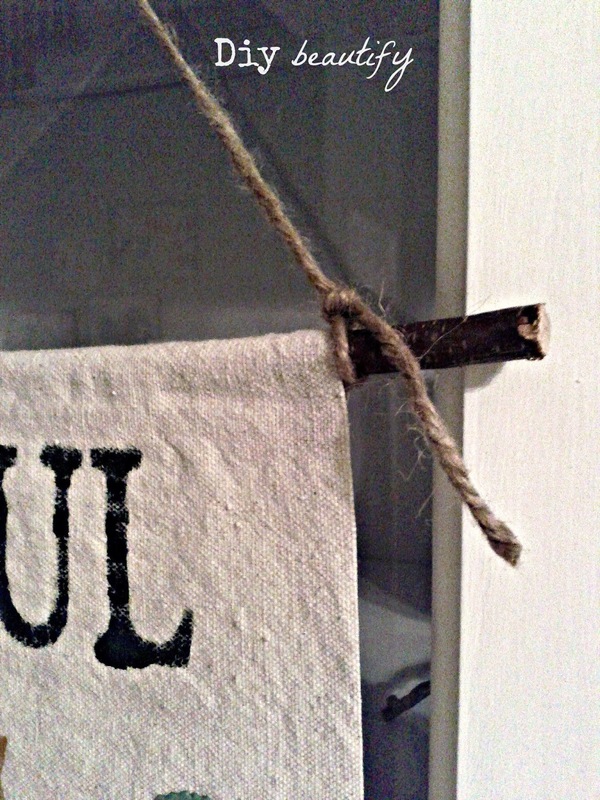 A piece of jute tied around the top branch makes for easy hanging. The tree is a simpler version so the kids could cut it out; we used adhesive felt. We opted to attach the leaves because it badly needed some color so the kids could appreciate it more...and because adding the leaves was the FUN part! It was great to see the variety of creative expression! They are going to add their Thankful Thoughts to the leaves on Thanksgiving, using Sharpie. 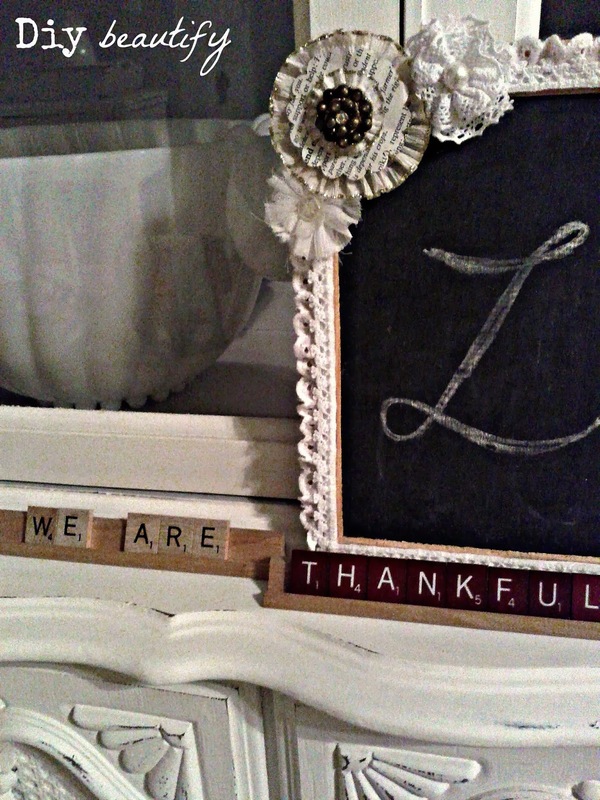 I made a stencil for the word 'Thankful' and the kids filled it in with paint. They loved this project and were able to easily accomplish it, with a little adult help, in under an hour!! Of course, I had to make one for my home because "the original" will be going home to my mother-in-law's this Thanksgiving. 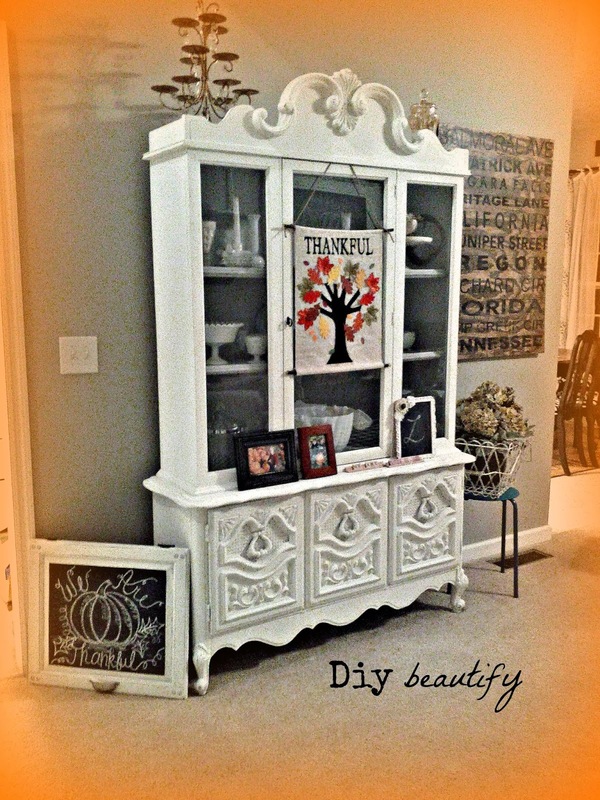 I like using my white hutch as a display zone, that little ledge is the perfect landing spot for small pictures...umm, Mr. Diy calls this 'clutter', can you believe it?! Actually, I do kinda see his point...I just really like having things out where I can see and appreciate them..it's a constant battle (within me, not between us, lol!). As always, thanks for hanging out with me for a little while :) I am THANKFUL for each and every one of you!! It's beautiful, Cindy! This would make a great art project with kids--maybe I'll make one with construction paper and write down what they're thankful for. Thanks for the inspiration! I'm hopping over from Work It Wednesday(my link ups were #71 and 72)--have a wonderful evening! Thanks Carrie, glad to inspire you!! 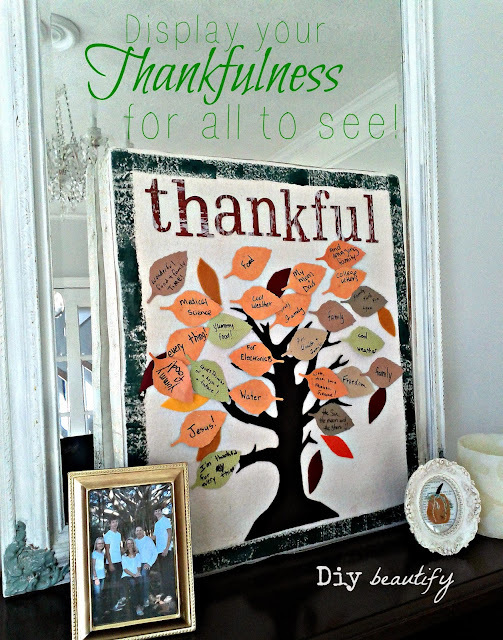 I like the idea of a construction paper one with your kids...whatever gets them thinking 'thankful thoughts', lol! Especially with the 'greediness' of the holidays just around the corner, it's so good to take time to focus on our blessings :) I'm off to check out your link ups.